Yes, I did go see Waiting for Godot at the Taper on Friday night, and it was marvelous. It was surprising how fresh and entertaining the play was, and how moving in its conclusion, especially given how many times I’ve seen productions of it. Big congrats to the cast, director Michael Arabian, all the designers, and everyone else involved, on a flawless production. But there’s another production that I’d like to talk about at greater length. 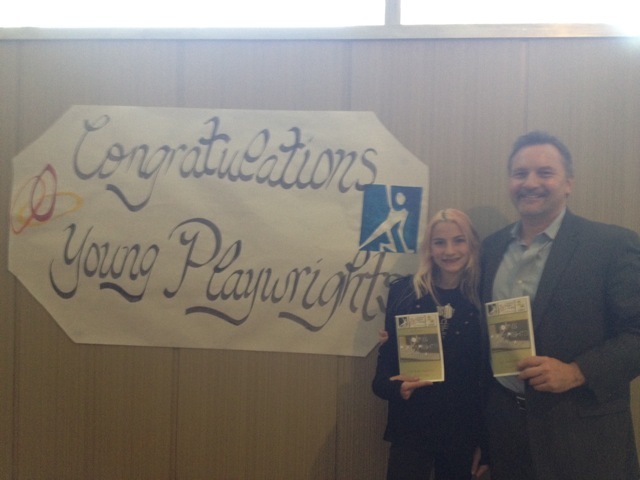 On Tuesday night I was able to see another play, this one the world premiere reading of a new play that marked the literary debut of a promising new playwright: my daughter Emma. Emma is an 8th grader who participated in a program at her school by Center Theatre Group — the folks who put on that Waiting for Godot production you should see — wherein students work for many weeks with a playwright who is a teaching artist to learn how plays work, and how to write one. Over the course of the school year, they do improv games, write scenes and lines of dialogue, and get to work with professional actors, culminating in an evening of readings by those professional actors. (One of whom, it turns out, was Rob Nagle, whom I’ve worked with at Moving Arts.) Eight of these brief plays, each of them co-authored by small groups of the students, were performed on Tuesday night by the actors. A father asks his (13-year-old?) daughter if she’s done her homework. She says she wants to watch TV first. (As I was watching this unfold, I was immediately hooked by the theatricality of this setup. I closely related to it, and its inherently theatrical complications.) He gets angry and loses his cool — so the daughter and her mother leave. They just get on a bus and leave town. For good. And then the father is angry with himself (for enforcing homework, I guess). Clearly, there’s a lesson here for all of us, and that lesson was not lost on me: Be careful about how you insist on homework getting done, lest your wife and daughter get on a bus and leave town for good. I was impressed with all eight of the students’ plays. They were funny, they were dark, they were brave, and they were untrammeled by the proclivities of professional playwriting that insists upon such things as subtext. In these plays, what is said is what is meant, and that made me hunger for such a world, where if we don’t want to go somewhere we say it, where if we want something from each other we just demand it immediately with the expectation that it will be given. The evening was a window into the mind of 13-year-olds, and that made for an experience I’ll long remember. And I offer this as proof: Tonight I took my family out to dinner, and then when we got home, we watched some TV. And when it was over, and only when it was over, did I tell my daughter to go do her homework. I don’t want to find her with a one-way bus ticket to elsewhere. I’m seeing Waiting for Godot tonight at the Mark Taper Forum. a production by the Dublin Gate Theatre in 2006 at UCLA Live that, despite its acclaim, I didn’t like at all because it was so meaningful. “Godot” is much better when played as vaudeville; Robin Gammell (above) was an excellent clown. The play is intended to be played that way — one stage direction has a character “scratching his head like Stan Laurel.” When it’s filled with portent, it’s a drag. And that’s what this production was like. I’m sure I’m leaving out four other productions. Minimum. And yet, I’m going again. Why? Top-notch cast, including Alan Mandell (who is now 84 and unlikely to be doing this sort of thing much longer; sorry, Alan), and featuring two actors who knew and worked with Beckett himself (Alan, and Barry McGovern); a video clip (above) from the production that, just in this excerpt, shows that the approach is right; it’s one of the most important plays of the 20th century and one I find deeply effecting; and, well, my friend Dorinne had an extra ticket and invited me. Two or three times a year, I get called upon to judge theatre competitions of varying sorts. This year, I’m one of the readers for the PEN USA literary awards, which is always an honor. And this Saturday evening, I’m a judge of this playwriting and performance event at the Secret Rose Theatre. It sounds like a lot of fun. If you’re around, stop by. I have mixed feelings about contests, awards, and prizes. In grad school, one of my playwriting professors, Jerome Lawrence, told me he was against writing contests because it pitted writers against writers. I understood his point of view (and that’s an indication of just what sort of a guy Jerry was: generous beyond measure), especially as someone who at that time had already been on both sides of prize-winning — winning one when I wasn’t sure my play was the best, and losing the same contest the next year when I was sure mine was. Especially when there’s a performance element in judging a playwriting contest, a lot rides on elements outside the playwright’s control: How responsive was the audience on the judging night, how “on” were the performers, was it too cold or too hot in the theatre, how was traffic on the way there, was the box office friendly or surly, and so forth. At the same time, believe me when I say I understand the marketing value of winning any contest or award (and, sometimes, the prize value). I don’t care which movies have won which awards, believe me (especially when it’s a system that awards “Best Picture” to “Avatar”). But do awards build careers, and would I put the full thrust of marketing and PR behind any awards won? You bet. There is a story — and I don’t know how reliable it is — that, 40 years ago, the Nobel committee was deadlocked between giving the award for literature to either Samuel Beckett or Eugene Ionesco. Finally, after much deliberation, one of the Ionesco champions who felt that Ionesco’s work had a broader scope than Beckett’s (and there may be something to that), switched sides to end the deadlock. And so: Samuel Beckett won the Nobel, and Eugene Ionesco never did. Is the work of Beckett, the Nobel-prize-winning writer, better than that of Ionesco? Beckett has become far more deeply rooted in the cultural consciousness — referenced in “The Simpsons,” name-checked on “Quantum Leap,” parodied on Sesame Street — and a lot of that came from winning the Nobel. It looks like the major critics have abandoned waiting for “opening night” — whenever that will be — of the musical “Spider-man: Turn Off the Dark,” and are now running reviews. Their calculation, no doubt, is this: The show is doing major box-office business, it’s big talk in theatre circles, and it’s essentially being reviewed daily on the internet by people who’ve seen it. So yet again, old media and its old way of doing business is responding too slowly to new dynamics. But since this show was looking as if it might settle into being an unending work in progress — with Ms. Taymor playing Michelangelo to her notion of a Sistine Chapel on Broadway — my editors and I decided I might as well check out “Spider-Man” around Monday, the night it was supposed to have opened before its latest postponement. You are of course entitled to disagree with our decision. But from what I saw on Saturday night, “Spider-Man” is so grievously broken in every respect that it is beyond repair. What he and McNulty are describing is spectacle. Whether or not one subscribes to Aristotle, it’s good to bear in mind that he ranked spectacle low on the level of artistic achievement. Story is important for a reason. Even the elementally simple “Waiting for Godot” has a story — and a good one. And I can personally testify that Spider-Man has featured prominently in any number of good stories for the past 50 years. The character on the right in the photo above is Hammerhead. Hammerhead is bar none the lamest Spider-Man villain, even lamer than Stiltman (who, really, is a Daredevil villain). Stiltman is just a guy on, well, stilts. Hammerhead is just a guy with a steel plate in his head. I once met a guy with a steel plate in his head; it didn’t give him superhuman abilities, it just protected what was left of his brain. He was almost as dumb as Hammerhead. 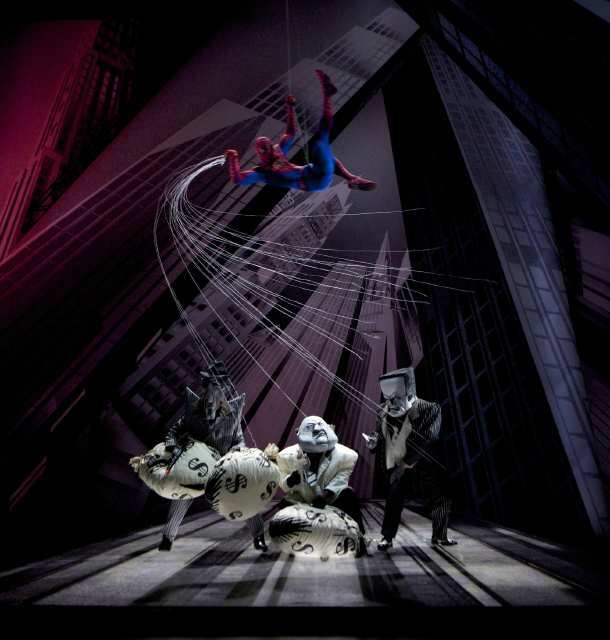 I didn’t realize that Hammerhead was in the Spider-Man musical; seeing him there alerts me to just how misbegotten this show must be, and makes me wonder how much better the show might have been had they hired any one of the writers who’ve written all those solid comic-book stories to at least consult on this. Now that I’ve ended my day of internet silence — and thank you again to everyone here who joined me in helping to make the internet more available to everyone, especially those struggling with slow connections — I thought I’d share this great news. The previously lost Beckett play, “Attack the Day Gently,” has been found! Here are the details. Thanks to Mark Chaet for alerting me to this! You are currently browsing the archives for the Beckett, Samuel category.